GPASC Rescue is a private rescue and foster care organization, created for the safe haven and permanent placement of homeless Great Pyrenees. 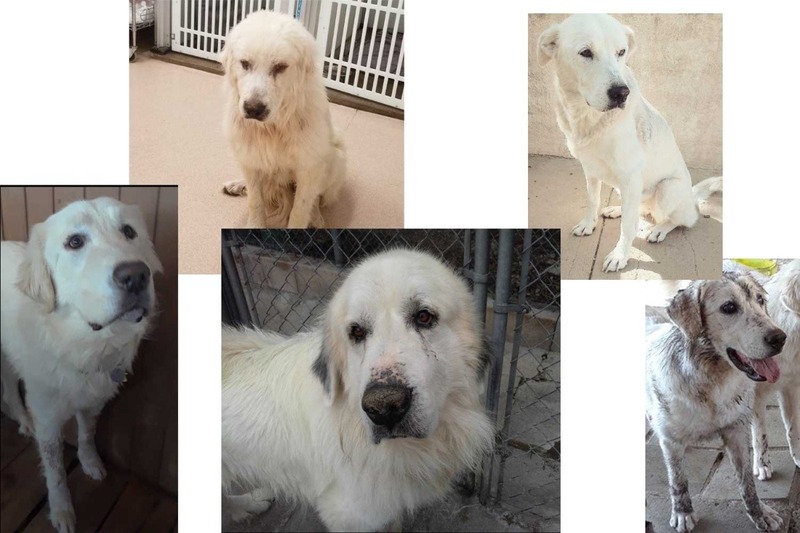 There are homeless Great Pyrenees dogs being turned in all the time. These dogs have been abandoned or turned over to shelters for one reason or another and are in need of medical treatment, food, and loving homes. Please Help! There are seven dogs currently being boarded at a vet because GPASC has no one to help foster or adopt these animals. Please help by fostering, adopting, donating or sharing! Thank you all for your kindness and generosity! Your donations are greatly appreciated! At this time, Dottie is in a lot of pain, but improving. Her broken bones are going to take quite some time to heal and for this reason, your help is needed and appreciated more than ever. Amber is working 24/7 taking care of the dogs and now, Dottie. The greatest need today is to pay off the vet bill so the dogs in boarding can go to the Rescue. These dogs have recently been rescued from shelters and would love to have a safe haven at the Rescue until they can find a home of their own. There is also an urgent need for people to foster and adopt. These wonderful dogs would love to find a forever home so please consider fostering or adopting. They may just turn out to be the one that rescues you! If you aren’t able to foster or adopt, please donate if you can to help with vet bills, boarding and daily expenses. Every single dollar helps and every single dollar is appreciated. Thank you so much and please share because sharing helps too!! URGENT UPDATE.... DOTTIE IS DOWN!!! Dottie fell yesterday in the kennels, she broke her shoulder and fractured her wrist immobilized with a stabilizer. Amber is now at the Rescue 24 hours a day caring for the dogs and Dottie. Greta is assisting with the kennels. WE NEED HELP...Volunteers to help with the kennels, feeding, taking dogs for vetting, DONATIONS and FOSTER/ADOPTERS IMMEDIATELY! Thank you for anything you can do to help! !